I've been curious about juice cleanses for a while. So much so that I put it on my 30 before 30 list! I haven't had the best relationship with food recently, and I felt like I wanted a fresh start in 2017, so....I ordered a 3-day cleanse to start the year off! I did a lot of research, both on the opinions of people who had done cleanses and the companies that sold them. I settled on the 3 Day Classic Cleanse from Jus by Julie. The 3 Day Classic Cleanse includes 18 juices - six per day. They are numbered one through six and you are supposed to drink them in that order. The main/green juices are the same each day, but the "snack" juices vary. I really appreciated the variety to keep things interesting! My favorite was PB & Jus, which tasted just like a peanut butter and jelly sandwich. I also thoroughly enjoyed the Chia Berry, which reminded me of Strawberry Lemonade. Matcha Chia aaaaaalmost tasted like a cinnamon latte, if I closed my eyes and tried really hard to pretend! I went into it thinking the first day would be a breeze (thanks to having a major caloric surplus after the holidays, I thought I'd be too full to care), the second day would be kinda tough and the third day would be the biggest struggle. Boy, was I wrong. I started off strong. I didn't really miss breakfast (I wasn't that hungry to begin with) and made it through my first two or three juices with ease. Then, it hit. I was hungry. I felt light headed. I was exhausted and weak and basically felt like I had the flu. My head was pounding and Excedrin didn't help. The instructions that I received along with my juices said egg whites were allowed, if needed.....so, I had egg whites for dinner - the tastiest egg whites I've ever eaten! They made me feel a little bit better, but I ended up taking a nap because I was so miserable and I went to bed around 8:30, just to end the day. I could barely stomach the last juice and honestly considered quitting on Day 2. I came to the conclusion that my body was in dire need of protein. I eat a pretty high protein diet and all six juices combined didn't have as much protein as one of my regular meals. That being said, I bent the rules and had protein powder + water for breakfast. Technically I was still drinking my meal, and I think it really helped! I also had egg whites again at lunch because I was STARVING. After the egg whites, my hunger subsided for the rest of the day. I did, however, continue to have a pounding headache. I felt good enough to go to the gym, although I only rode the recumbent bike for 35 minutes, which is significantly less work than I normally do. I calculated that I burned almost four of the six juices off......yikes. I started the day with egg whites - since they seemed to have such a positive effect on previous days. I did not battle a headache and was never overly hungry! I had protein powder + water at lunch to keep the momentum going. Again, after lunch, I wasn't very hungry at all. I found that I was forcing myself to drink the last few juices and/or drinking them very, very slowly - whether I was just tired of them or my stomach had shrunk, I don't know! I definitely felt the best on Day 3; I rode the recumbent bike and did some ab work at the gym with ease. Overall, I'm glad I did the cleanse. I wouldn't necessarily want to do it again, but I think it was the clean start I was looking for. 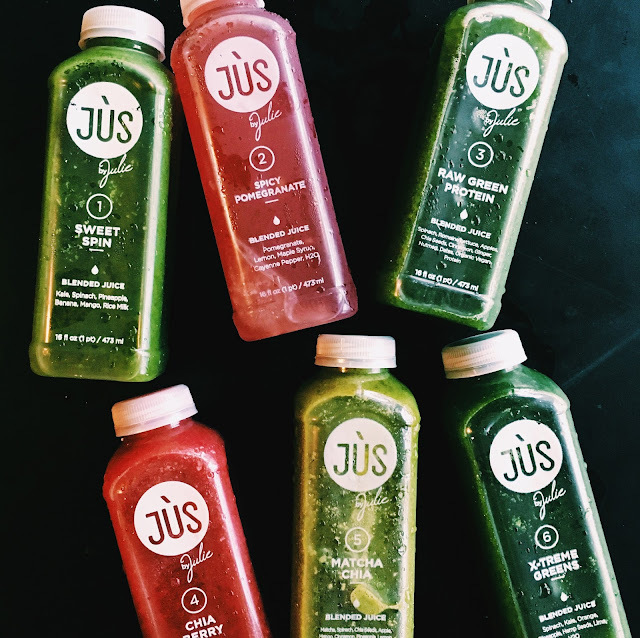 I originally had considered doing Jus by Julie's One Day Cleanse (on Day 1 I really wished I had), but considering how each day got significantly better, I'm glad I went with the 3 Day version. I didn't weigh myself before I started (too afraid of all the cookie weight...) but I definitely feel slimmer and less bloated/"blah" than I did a few days ago. I feel like the cleanse reset my brain and reminded me that food doesn't dictate my life or control my day. I was, however, slightly disappointed in the texture of the juices. When I buy fresh juice from Trader Joe's or Sprouts, it is often very thick and filling. These juices were watery (sometimes chunky) and did not sit heavy at all. I think having a heavier juice would have made it a lot easier to adjust on Day 1. I also really think the juices should have more added protein - even the juice titled "Raw Green Protein" only had five grams! My quads can't survive on five grams of protein! 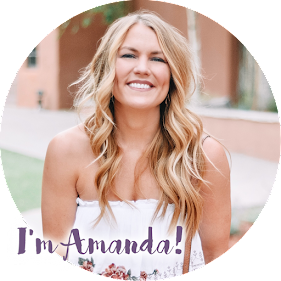 By the end of the cleanse, my mouth tasted very acidic which I didn't like...but afterwards, anything I put in to my mouth was bursting with flavor. If you want to gain a new appreciation for chicken breast, rice and broccoli, try doing a juice cleanse! You can try a Jus by Julie cleanse (or any their products, like PB & Jus), for 40% off if you use this link. Have you ever tried a juice cleanse? Would you ever? I'd love to hear your thoughts! In the mean time, I'll just be over here enjoying chewing real food again.